March 11, 2011 - The U.S. Department of Transportation's Bureau of Transportation Statistics (BTS) reported in a release of preliminary data that U.S. airlines carried 58.6 million scheduled domestic and international passengers in December 2010. This is a 2.9 percent increase from December 2009. The December 2010 passenger total was 2.1 percent above that of two years ago in December 2008 but still remained 3.6 percent below the pre-recession level of 60.8 million in December 2007. BTS, a part of DOT's Research and Innovative Technology Administration, also reported that U.S. airlines carried 2.6 percent more domestic passengers in December 2010 than in December 2009. 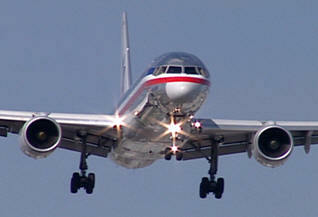 The number of international passengers on U.S. carriers in December 2010 increased 4.8 percent over December 2009. The December 2010 load factors of 80.7 percent systemwide and 80.8 percent domestic were the highest recorded for any December. For the full year 2010, the number of scheduled domestic and international passengers on U.S. airlines increased 2.4 percent from 2009 to 720.4 million. The number of passengers declined 3.1 percent from the full year 2008 to the full year 2010. U.S. airlines carried 1.9 percent more domestic passengers and 5.9 percent more international passengers in the full year 2010 than in 2009. In December, Southwest Airlines carried more total system and domestic passengers than any other U.S. airline. American Airlines carried the most international passengers. Delta Air Lines, following its merger with Northwest Airlines, carried more total system passengers in 2010 than any other U.S. airline for the first time since 2001 Southwest carried the most passengers during the previous three years. Southwest carried more domestic passengers in 2010 than any other U.S. airline for the seventh consecutive year. Delta carried more international passengers in 2010 than any other U.S. carrier after American had carried the most for 20 consecutive years. In December, more total system and domestic passengers boarded planes at Atlanta Hartsfield-Jackson International than at any other U.S. airport and more international passengers boarded U.S. carriers at Miami than at any other U.S. airport. More total system and domestic passengers boarded planes in 2010 at Atlanta Hartsfield-Jackson International than at any other U.S. airport for the 15th consecutive year and more international passenger?s boarded U.S. carriers at Miami International than at any other U.S. airport for the 16th consecutive year. In December, U.S. airlines operated 767,500 scheduled domestic and international flights, down 0.3 percent from the number of flights operated in December 2009. The number of domestic flights decreased 0.5 percent in December from a year earlier while international flights were up 1.6 percent. During the year 2010, U.S. carriers operated 9.5 million domestic and international flights, 0.5 percent fewer than were operated during 2009. Domestic flights decreased 0.8 percent from the previous year while international flights were up 2.8 percent.